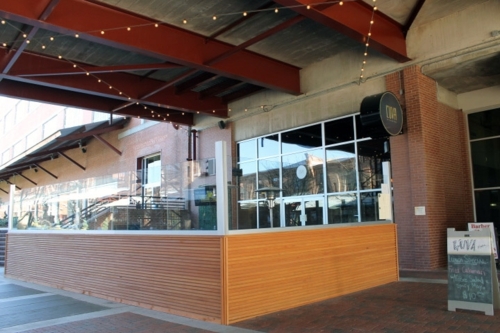 L’Uva opened in the American Tobacco District last year, replacing a sushi restaurant that didn’t seem able to adapt to the crowds from the Durham Performing Arts Center. 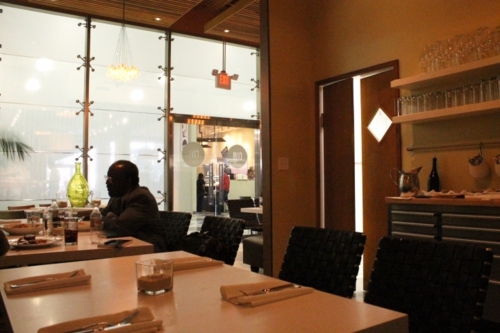 In its place is an upscale spot that focuses on using local ingredients to bring together Italian dishes that stray from your standard meatballs and marinara. I’m sure the large patio area is a draw when the weather is warmer, but I was surprised by the late lunch crowd during the day. We arrived about 12:45, and the space was mostly empty, but many tables were full by the time we left close to 2. The picture doesn’t capture it well, but I’d describe the interior as full of light with modest touches of minimalist décor and attractive, red-cedar-colored wood. L’Uva makes all their pasta in-house, but both the husband and I were in the mood for something in the sandwich vein. Luckily, they offer a few panini in addition to their pastas, entrees, salads, and hefty list of side dishes. 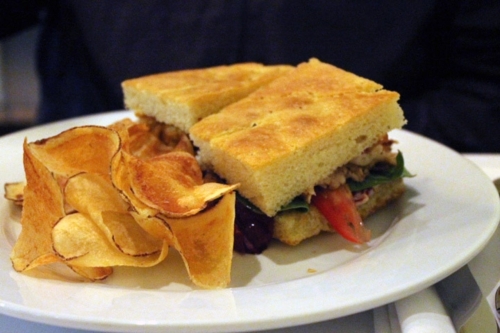 My husband had the roast pork, chicken, and smoked bacon panini on focaccia. It came with an adequately sized portion of potato chips. He thought it was good. Never being one to say no to variety, I opted for their light lunch, which is a half sandwich paired with either the soup of the day (an Umbrian potato soup), penne with marinara sauce, an arugula salad, or a scoop of gelato. I chose the arugula salad. 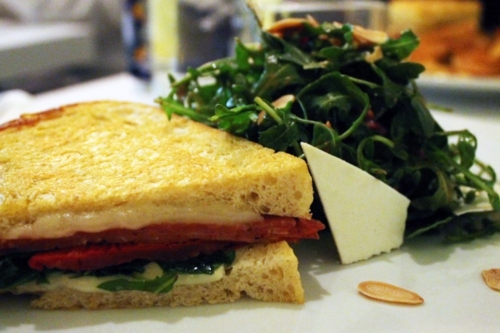 The sandwich is called a Toscano, and it’s made with salami, provolone, arugula, sundried tomato, and Italian bread. It was delicious, though I think I could taste a bit of metal from the sandwich press—not the best aftertaste ever. The salami was wonderful, but the vibrant sundried tomatoes were definitely the stars of the sandwich. The salad was also tasty, especially the garden-fresh arugula. It was dressed in a fig and balsamic vinaigrette and sprinkled with pomegranate seeds, sliced almonds, and ricotta salata. I found the crunch of the almond and pomegranate seeds together to be a bit redundant, but the flavors combined well. 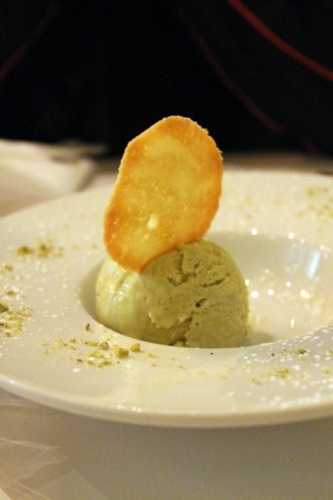 We decided dessert was on the agenda and chose a scoop of the pistachio gelato ($6). I was torn between loving the flavor of the pistachio—it is so good in dessert form—and finding the gelato rather too icy and almost a little pasty in texture. I hope to be back to try their pastas, and I’m sure I’ll manage it sometime before a DPAC show or meeting the husband for lunch again. It was also nice to see familiar faces from Revolution’s wait staff. They are sister restaurants, after all, and there were definite similarities in cooking style and atmosphere, even though they have entirely different focuses. I don’t think L’Uva is up to Revolution’s standards quite yet, but I’m confident it can get there.